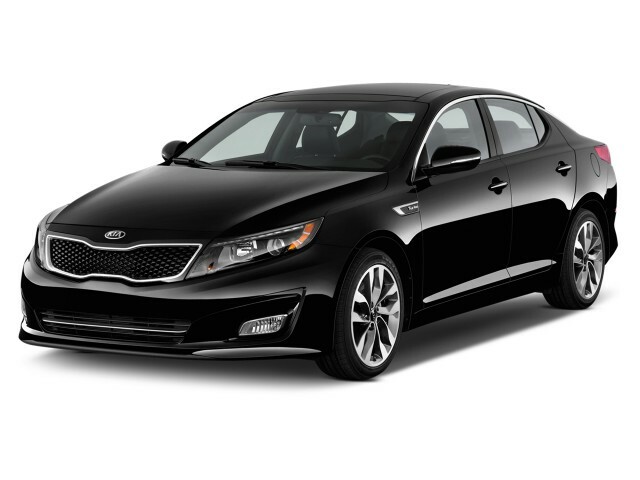 If you're looking at the new top-of-the-line 2014 Kia Optima SX-L, you might want to extend your cross-shopping to the new Kia Cadenza, which has a bit more backseat space and more refined, luxury-car character. The 2014 Kia Optima is a sensible and spacious four-door sedan, but it moonlights as something a little more stylish and adventuresome. The 2014 Kia Optima is updated for the new model year with a mild revamp that, well, optimizes things. 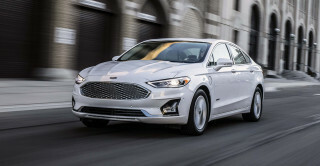 The attractive exterior thankfully doesn’t change much, keeping it at the head of an attractive class of cars that include the Ford Fusion and Mazda6. 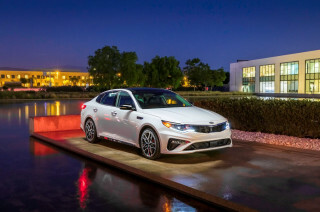 The current generation of the Optima was a turning point for Kia several years ago when it went on sale, replacing a homely, anonymous sedan with a bodacious new look. The look of the 2014 Kia Optima still fits right in, so changes are largely limited to a sharper front-end appearance, revised tail, and some new trims, with LED lighting and new LED fog lamps to be had on some of the model line. As well, there's a new EX-L (Limited) model with a plush Nappa leather interior. Overall, from the outside, the front airdam is just a little more pinched, and avoids the full-width 'grin' of the previous version--making the front end appear a little taller, in our opinion. Some versions also get a chrome strip along the side rocker-panel area. What doesn't change is that the Optima has one of the most pert silhouettes and an athletic stance, along with flashy wheel designs. Inside, the Optima doesn't make waves in the same way, but it's a classy, minimalist cockpit look, reminding us of Audi's interiors of a few years ago, with a wide rectangular bank of controls canted toward the driver. New TFT instrument-panel displays and a much-needed premium infotainment display occupy some new space, surrounded by some upgraded trims. As with most mid-size four-door sedans on the market, the 2014 Kia Optima is offered in several different performance flavors--all including a four-cylinder engine under the hood. 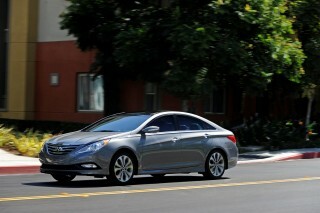 A 200-horsepower, 2.4-liter four-cylinder engine with direct injection is standard on all but the SX model. It's a little coarse when you need to access its full potential, but it's plenty perky in the mid revs and works very well with the six-speed automatic transmission. 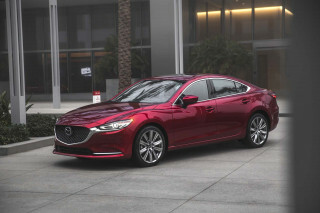 Those with more of a penchant for performance--yes, those who would have chosen the V-6 in the past--will find plenty of satisfaction in the sporty SX model and its 274-hp turbocharged 2.0-liter four-cylinder engine--along with paddle-shifters for the automatic. Here the Optima feels a step more aggressive than V-6 models of the Camry or Accord, in light-footedness if not brute-force acceleration. With a rather firmly tuned suspension and reasonably good body control, the Optima has a lean, confident feel on a curvy road. And with the new Drive Select system that's included in the SC model, you get several modes that command different transmission shift points and steering weighting. We'll update this with driving impressions as soon as we can test the system. The Optima Hybrid, with its electric-motor system and lithium-polymer battery pack that pair with a four-cylinder engine and six-speed automatic transmission (not a CVT), has been retuned for better drivability. It now has a higher-capacity lithium-ion battery, with the powertrain providing 199 hp of combined power and 235 lb-ft of combined torque, to yield acceleration that feels about on par with the base four but with better mileage (36 mpg city, 40 highway). New seat contouring addresses one of the Optima's shortcomings to date. The other is that getting in and out of the backseat can be a little tough due to the roofline. But once in, it's wide enough to fit three, with just enough headroom. Heated and cooled front seats available--heated back seats, too--the Optima and the back seats can be heated, too. Ride quality is on the firm side, but comfortable enough, and a new EX-L (Limited) model includes soft Nappa leather seating. A Blind Spot Detection System and rear parking sensors have been added to the options list, and they're available on all but the base LX model. The Optima earns five-star scores in all tests--including the side pole test--from the federal government. And it gets 'good' ratings in every test category from the IIHS (except an 'acceptable' in the new small overlap frontal test). That altogether still qualifies it for a Top Safety Pick+ rating, however. The Kia Optima has always offered a high level of features for the money--especially at the base level. But in recent years, the Optima has added sporty SX models and now the SX-L (Limited) model--both of which could be seen as luxury models if you go only by their features lists. For 2014 there's a new eight-inch navigation and telematics system, including a UVO eServices suite (driven off the driver's paired smartphone) plus eight-speaker Infinity sound, HD Radio, SiriusXM satellite radio, and SiriusXM Traffic.key system, with options for leather trim, a panoramic sunroof and Infinity audio. With a handsome, graceful profile and newly sharpened front and rear details, the 2014 Kia Optima remains one of the most distinctive mid-size sedans. Going purely by proportions, the 2014 Kia Optima isn't all that much different than any of the mid-size sedans in its peer set. 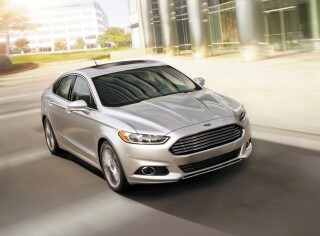 That includes models like the Honda Accord, Toyota Camry, Volkswagen Passat, or even the new Ford Fusion. But look a little closer and you'll find a set of details that add finesse to the profile, along with crisp, edgy details and, overall, more of a sporty side than you'll find elsewhere on most of these models. 2014 marks the first round of significant changes to the Optima since its last (dramatic) full redesign for the 2011 model year, and with the success of that current design it's been smart in keeping the changes minimal. Front and rear fascias have been redesigned, and new LED fog lamps and running lamps, along with LED rear lamps, have been subbed in. Overall, the front airdam is just a little more pinched, and avoids the full-width 'grin' of the previous version--making the front end appear a little taller, in our opinion. Some versions also get a chrome strip along the side rocker-panel area. Kia hasn't done anything with the one exterior detail that we found a little cheesy: the side plastic-insert 'vents' at back of the front fenders. The Optima remains closely related to the Hyundai Sonata, although it couldn't be more different on the outside. 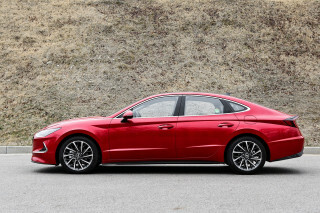 The Sonata has an exuberant, flowing aero look, while the Optima is sharper, more restrained, and a bit sportier and more formal. While the Optima is very sharply dressed outside, it's more business inside; there's a definite cockpit influence--somewhat like Audi models past--with a big set of gauges and a wide rectangular bank of controls canted toward the driver amount to a simple, elegant look. A new 4.3-inch TFT display is new to the instrument cluster, and a new eight-inch display is included with the available navigation system. The Optima has a lot of driver appeal, thanks to gutsy powertrains and responsive handling. As with most mid-size four-door sedans on the market, the 2014 Kia Optima is offered in several different performance flavors--all including a four-cylinder engine under the hood. 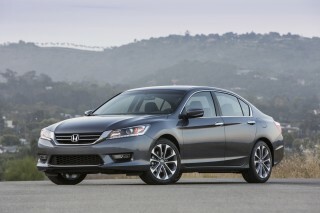 A 200-horsepower, 2.4-liter four-cylinder engine with direct injection is standard on all but the SX model. It's a little coarse when you need to access its full potential, but it's plenty perky in the mid revs and works very well with the six-speed automatic transmission. 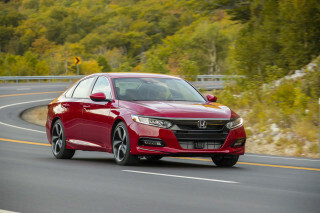 Those with more of a penchant for performance--yes, those who would have chosen the V-6 in the past--will find plenty of satisfaction in the sporty SX model and its 274-hp turbocharged 2.0-liter four-cylinder engine--along with paddle-shifters for the automatic. Here the Optima feels a step more aggressive than V-6 models of the Camry or Accord, in light-footedness if not brute-force acceleration. In past model years, we've found the Optima's steering to be a little on the firm side in feel compared to many other models in this class. With a rather firmly tuned suspension and reasonably good body control, the Optima has a lean, confident feel on a curvy road. With the new Drive Select system that's included in the SC model, you get several modes that command different transmission shift points and steering weighting. We'll update this with driving impressions as soon as we can test the system. The Optima already had a quiet, composed, and roomy interior; new seats for 2014 make that package even better. If you're looking for seating space for five, the 2014 Kia Optima is actually one of the roomier sedans in its class. And while its interior accommodations have gotten even better this year, there are still a few packaging issues that keep it from being at the top in this category. In the past, we've found the Optima's front perches to be too short and flat for even average-sized men, with a lack of support in the lower cushions for longer trips. For 2014, the seats have been improved, with new contouring. In EX versions you do get power controls and greater adjustability. 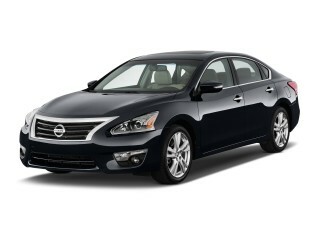 And at the top of the line, in the EX-L model, you get plush Nappa leather upholstery. In back, there's actually enough width in back for three across, provided your passengers aren't too tall or wide, and there's plenty of legroom as well as just enough headroom for taller adults. The only caution we've noted is that you might need to duck your head around the doorline's cut for the long-sloping roofline. On EX and SX models, you can get heated and cooled front seats—as well as heated back seats. 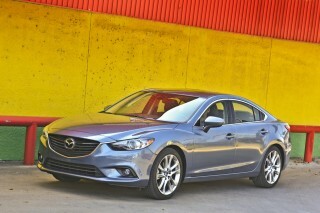 They're all pleasant-surprise features not typically found in this sort of affordable mid-size car. In past model years, we've appreciated the way the Optima rides--firmly, but with just enough damping to filter out most bumps and caorse surfaces. The trims and materials in the 2014 Optima can be a bit drab at the base model, but that's the case in this entire class. Move up even to EX models and you get leather trim and wood interior accents.SX-T models get brushed metal trim and metal pedals, while top SX-L (Limited) models get more supple Nappa leather that's truly a class above. Although the Optima's instrument panel, which is canted slightly toward the driver, gets a new TFT instrument panel display and eight-inch navigation system in some models, there's still a lot to like about its simplicity--as it doesn't resort to a complicated controller or system of menus. The Optima remains one of the safest sedan picks; and blind-spot detection is newly optional for 2014. The Kia Optima has in past years finished near the head of the class; and we see no reason why that should change for 2014. Top crash-test ratings from both the insurance-funded IIHS and the federal government all add up to one of your best mid-size sedan picks for safety. Front active headrests are standard in the 2014 Kia Optima, along with front seat-mounted side airbags and side-curtain bags. So is Brake Assist, and Hill Assist Control, which helps avoid rolling back when starting uphill, and electronic stability control. A Blind Spot Detection System and rear parking sensors have been added to the options list, and they're available on all but the base LX model. The Optima earns five-star scores in all tests--including the side pole test--from the federal government. And it gets 'good' ratings in every test category from the IIHS (except an 'acceptable' in the new small overlap frontal test). That altogether still qualifies it for a Top Safety Pick+ rating, however. It's worth noting that while the Optima is structurally similar to the Hyundai Sonata, the Kia has a number of different details. And those apparently make some difference here, as the Optima manages a five-star federal score while the Sonata only achieves four. All-new infotainment systems for 2014 remedy what had previously been an Optima shortcoming; and throughout the lineup, you still get a lot of value for the money. The Kia Optima has always offered a high level of features for the money--especially at the base level. But in recent years, the Optima has added sporty SX models and now the SX-L (Limited) model--both of which could be seen as luxury models if you go only by their features lists. And now, for 2014, it's taken care of the one inadequacy in the lineup: infotainment. For 2014 there's a new eight-inch navigation and telematics system, including a UVO eServices suite (driven off the driver's paired smartphone) plus eight-speaker Infinity sound, HD Radio, SiriusXM satellite radio, and SiriusXM Traffic. The base Optima is still a strong value, with Bluetooth hands-free control, cruise control, a USB port, satellite radio, and power windows, locks, and mirrors all included. Even mid-level EX trims get things like dual-zone climate control, push-button start, and a smart-key system, along with leather trim. A panoramic sunroof and Infinity audio are available as options. A Supervision meter cluster, sport suspension, larger alloy wheels, LED front and rear lamps, steering-wheel paddle-shifters, lighted scuff plates, and leather sport seats are included in the SX. SX-T models include HID headlamps with auto-leveling. Top SX-L models include LED fog lamps, red brake calipers, a new electronic parking brake, chrome side sills, and new premium Nappa leather upholstery. Separately, heated-and-cooled front seats, and a heated back seat, are available in EX, SX, or SX-T trims. 2014 Hybrid details still hadn't been released at the time of posting; but last year's Hybrid EX sedans got a rearview camera, a panoramic sunroof, heated and ventilated front seats, and Infinity audio standard. All the Optima models get great gas mileage; but it's the Optima Hybrid that wows with its 38-mpg Combined rating. The 2014 Kia Optima isn't quite class-leading for fuel economy; but it gets great ratings for such a roomy, responsive sedan. Models with the base engine earn as high as 35 mpg; and even if you go for the Turbo you're not losing much, with EPA ratings at 22/34 mpg. An Eco mode can help improve real-world fuel economy by up to seven percent, Kia says, by smoothing driver inputs to the accelerator. great all around car.steering is fine.best warranty in class. Amazing car for the price! This car would cost much more if a different name was on it! It has many more options than the competition. The power is good for a four cylinder. There are some bad reviews about the steering but it's fine to... This car would cost much more if a different name was on it! It has many more options than the competition. The power is good for a four cylinder. There are some bad reviews about the steering but it's fine to me. It steers more like an older Cadillac than a 350Z. A more luxury feel than sporty. The only thing that I see flawed in its performance is the short braking. When you have to jam on the brakes it may be better to pump twice because it kind of catches the rotors wrong sometimes. Not that it doesn't stop but it's just a little awkward. Other than that it's a great car.